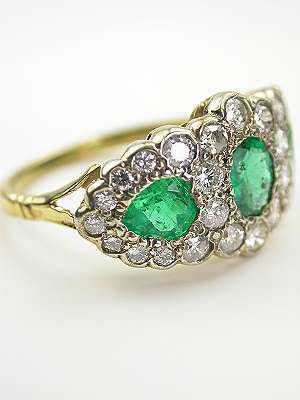 Full cut diamonds encircle a trio of emeralds in this antique ring. 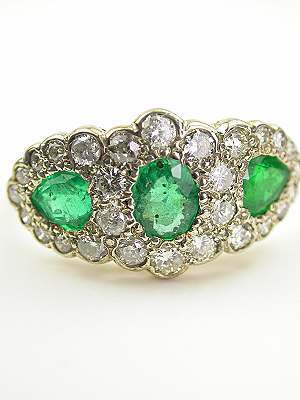 In this winter ice versus spring verdant duel, the springtime green of the oval and pear-shaped emeralds ultimately wins out. 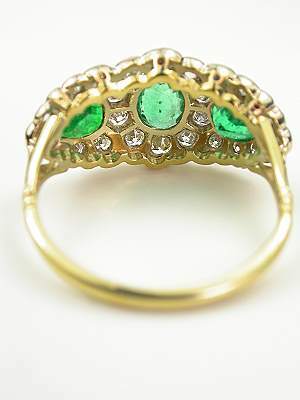 The 14 yellow gold band of this antique ring has a scalloped trimmed top and offers metallic contrast to the emeralds and diamonds. Details: 14k yellow gold. Full cut diamonds; 0.66 carats. Oval and pear emeralds; 0.85 carats. Antique, Circa 1930 or later. 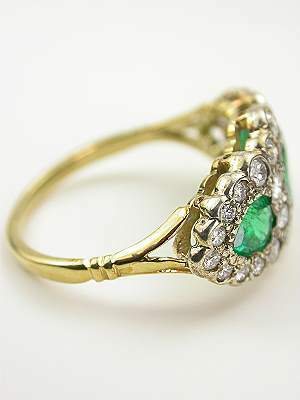 Special characteristics This hand wrought classic antique ring with oval and pear shaped emeralds, features a scalloped top with an azured back.